In team-based games like League of Legends and Team Fortress 2, and MMOs like World of Warcraft, support classes—medics, buffers, debuffers, etc—are a necessary element of victory. However, they’re under-appreciated and sometimes under-played. Overwatch addresses that problem in some smart ways, but it doesn’t completely solve the problem. Whether in single or multiplayer games, support classes have long been considered the least popular kids at gaming’s table. And why not? While DPS (damage-per-second) and tank classes are out making huge plays and soaking up surefire death, supports tend to lurk in the back or to the sides, healing, buffing, and shielding. Their jobs are equal parts stressful and inglorious. They’re the janitors, the metal band bass players, the people who ensure wacky waving inflatable arm-flailing tube men ad displays don’t soar into traffic and cause the most hilarious tragedy of 2016. They’re easy to take entirely for granted, unless, of course, they’re doing their job poorly. Then they become a tank of a sort, sponging up the rest of the team’s blame for a crappy performance that may not have entirely been their fault. Certainly, MOBAs like League of Legends and DOTA 2 have spiced up the lives of supports through variety and more nuanced mechanics, and games like Destiny sorta rolled them into other classes, but we still live in a world where starry eyed children dream of growing up to be astronauts, firemen, and minigun-toting glory hogs. As soon as I started playing Overwatch, I noticed something. At the post-game commendations screen, it sure seemed like supports received the truest form of love of all—upvotes—from friends and foes the majority of the time. I decided to start keeping count. 30 games later, I found that characters like Mercy and Lucio (and more infrequently, less easy-to-heal-everybody-with folks like Zenyatta and Symmetra) got the highest number of commendations 57 percent of the time. I admit that it wasn’t the most scientific method ever, but I still think the results are telling. It’s not an overwhelming majority, but it’s a big improvement from, well, not much at all. Blizzard built a system into their game that succinctly shows players just how much of an impact supports (mainly healers) have on matches. Players are, in turn, grateful, and that is, in turn-er, great! On top of that, most of Overwatch’s supports don’t play like typical supports. Mercy is the only pure medic, but she’s also remarkably nimble and capable of buffing damage. Lucio can constantly heal all nearby teammates or boost their speed while dealing damage himself. He also has sweet roller blades and can use them to escape from giant holes, which is the main reason roller blades were originally invented. Zenyatta can focus healing on a single ally, debuff a single enemy, and ult everybody to a state of near invincibility for six seconds. He’s also not completely hopeless in a fight. Symmetra isn’t even a healer. She aids defense with turrets (tip: place them on flanks every time) and shaves precious seconds off pushes with her portal. Oh, and then there’s Zarya, who’s not classified as a support, but is essentially a tank/support hybrid. The list goes on. And then there are subtle things like map design. Try to find a map where Symmetra can’t lay down a decently effective turret setup, or Lucio can’t maneuver, or Zenyatta can’t craftily work his magic just out of harm’s reach. No map is perfect, but it’s clear that Blizzard put a lot of thought into each characters’ viability on them. Naturally, some players who don’t play supports in other games have found themselves tempted, even converted by Overwatch. That’s great. Supports deserve just as much love as traditionally more exciting classes from both players and developers. Along the way, players might even learn support’s deep, dark secret: It’s fun to help other people. It feels good, especially when teammates (and even opponents) appreciate your hard work. The bond a good healer-tank duo shares? There’s nothing else quite like it. In my experience, however, Overwatch still isn’t in an ideal place with its supports. There are a couple key issues. First, while players can vote to show their appreciation after matches, they’re not always incentivized to cooperate with or even focus on supports mid-match. At least, not in a way that produces results. Playing Mercy, especially, can be a crapshoot. Sometimes you’ll play with a team that Gets It, whose tank(s) and damage-dealers keep her shielded and out-flank her flankers. Other times, they’ll just try to smash everything and expect Mercy to clean up after. Hey Reinhardt, why not block me with your holo-shield that’s 20 times my size and, no, you’re gonna charge 30 feet away from me, your lifeline, into certain doom? OK then. Yo Roadhog, you wanna yank this Genji off me? Oh, you don’t? McCree, Tracer—anyone wanna help? Where some additional prominent “DEFEND YOUR DAMN HEALER OR YOU WILL DIE” signage throughout Overwatch might help that situation, I feel like some players (especially newer ones) are simply confused by the likes of Lucio, Zenyatta, and Symmetra. Their roles aren’t as clearly delineated as Mercy’s, not to mention pretty much everyone else in the game. For example, you should almost always make sure you’ve got a healer before picking Symmetra, even though she’s listed as a support. That kind of thing. I feel like it’s sometimes not enough to follow in-game tips to figure out how to play as and with these characters. You’ve gotta seek out knowledge. You’ve gotta be willing to go the extra mile. On the upside, I think a lot of players are willing, as Overwatch is a game that encourages you to have at least a working knowledge of every character. But those who aren’t end up affecting matches’ overall quality, especially for the support players in question. There are also smaller issues, like the fact that Play Of The Game doesn’t do a great job of highlighting clutch heal moments, nor can it really capture the ramifications of great sustained Symmetra, Mercy, Lucio, or Zenyatta play. 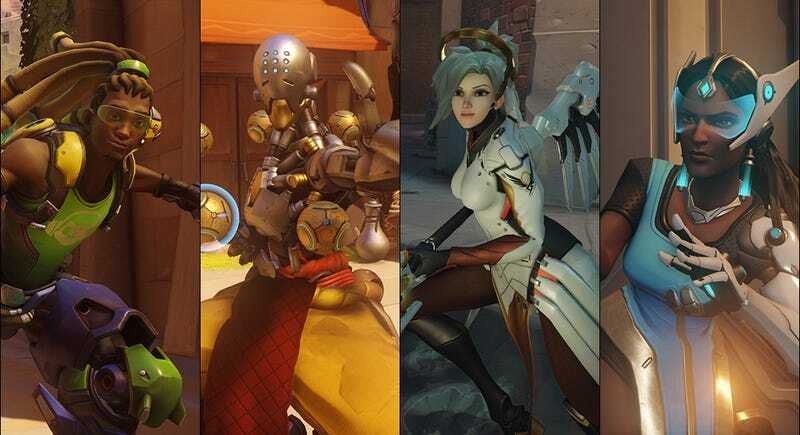 In that respect, Overwatch still feels like a game designed with damage dealers, tanks, and Bastion in mind first and foremost. On the upside, Blizzard says they’re working on it, but it remains to be seen what sorts of changes that work will bring. As a result of these things, I often find that players will reach the end of the pre-game character selection process, only to find a big support-shaped hole in the team’s heart. When I decide to bite the bullet (and, depending on my team’s ability to defend, sometimes many more), it’s hard not to feel locked into the role for the rest of the game. At the very least, we need one healer, and nobody else wants to do it. At that point, I don’t really have a choice. I’m glad Blizzard has taken so many steps to make playing as a support character more appealing, and I enjoy receiving a good deal of post-match appreciation for it. But there’s still more work to be done, some of it subtle, some of it all-encompassing. Overwatch is off to a good start. Now it’s time to see if they can really, truly do this all day.